At the Fort Worth dental office of Gary N. Pointer, DDS, we are dedicated to incorporating the most innovative dentistry technologies into our office in order to ensure patients feel relaxed and comfortable throughout their time with us our Fort Worth dentist and team. When we choose to invest in a technology, we ask that it offer our patients three main benefits – improved comfort, reduced risk, and better results. 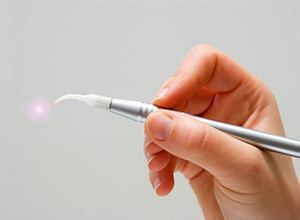 Soft tissue laser dentistry exceeds even our highest expectations for dental technologies. It offers us the ability to remove, treat, and reshape soft tissues without using a scalpel or stitches that can be traumatic, lead to difficulties during healing, and cause a number of other concerns. 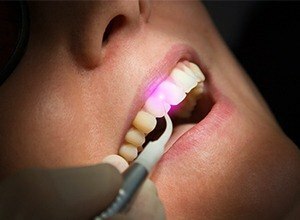 If you want to learn more about the use of soft tissue lasers in our dental office or schedule an appointment to visit our team, call our Fort Worth dentistry practice today. We look forward to discussing the many benefits of incorporating innovative dental technologies into our office, and our dentist and dental team can’t wait to see your smile! Removal of excess tissues from other parts of the mouth to ensure healthy function, typically used as therapy for lip or tongue tie. During treatment, there is little to no bleeding, meaning that these services are safer and more comfortable for patients. The laser cauterizes as it removes tissue, meaning we typically do not need to place stitches, which can accelerate the healing process and improve comfort after treatment. 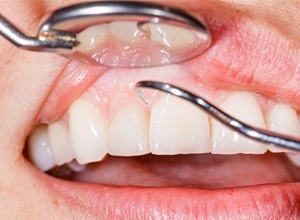 Following soft tissue procedures, patients are at greater risk for infection, especially those with gum disease, but after soft tissue laser treatment, patients heal much more quickly dramatically reducing chances for infection. After soft tissue laser treatment, patients experience little to no swelling or inflammation, and they are almost completely recovered within the first 48 hours. Soft tissue lasers use waves of light to pinpoint and destroy damaged, inflamed, or excessive tissues. Traditionally, we would use scalpels to cut away soft tissue, and sutures to reattach the soft tissue. The laser light waves cauterize as they cut, minimizing bleeding and discomfort during treatment, and accelerating healing after the procedure to reduce risk for infection and limit chances of bacterial accumulation leading to further irritation and soft tissue damage.